I’d like to tell you a story. When I’m done, I’d like you to tell me yours. I’ll explain, but first: How Green Devil Became Green Devil. All I wanted was a recycling bin. Innocent enough. Before I first came to Duke as a graduate student, I worked in an office building—a “real” person, I liked to say, with a paycheck. In my cubicle, there were the normal things: a picture of my mom, a computer with a huge CRT monitor, a stapler (not red). There were also two bins under my desk, one for trash and one for recycling. Every night or morning when I was gone, the trash and recycling would magically disappear. Pretty cool, huh? I thought it was like that everywhere. Then I got into grad school, moved south and into an office on campus. There was only a trash bin. A cardboard box had been designated as the recycling bin but it had to be kept away from the trash, lest it be confused for extra rubbish. When it was full of paper, magazines and empty bottles, my office mate and I would take a field trip out into the hall, around to the front of the building and upstairs to the sorting station. This just didn’t make sense. Were we the only ones doing this? What happened to the recyclable materials in rooms without a cardboard box? Shouldn’t there be a closer sorting station? It was clear to me that the whole process should be easier and integrated with the existing trash service. So we mobilized, and the Graduate and Professional Student Council Green Team was born, complete with an official logo made by the Duke Innovative Design Agency. We were well on our way, and a plan was taking shape. Before we could tackle the big fish of having the recycling taken out at the same time as the trash, we would impress the administration with a small scale office recycling bin program and demonstrate through survey data that people wanted their recycling taken out for them, but that office bins were awesome! It only sort of worked out that way. The GPSC Green Team Recycling Bin Distribution Pilot Program (RBDPP, catchy right?) was deemed a moderate success. Those who got office recycling bins through the program confirmed that they are awesome and they are used. But there were also lessons learned. For starters, it turns out large populations of graduate students don’t have offices, so they had no need for an office bin, but central locations are important. And it was hard work getting people to request a bin in the first place. (Laziness? Apathy? Bad marketing skills?) Direct intervention seemed the most effective. Then there were students who wanted bins but were in buildings that were not served by Duke Recycles. Denied. And a bureaucratic trap we walked right into trying to remedy. The clearest point we determined was that the size of the project, the duration and the time required to execute it were about the maximum we, as students with other obligations, had time to implement. This was an important lesson, because alas, our original goal of integrated pick-up service was still a good chunk of time, effort and the stars aligning away. There are still a few bins left through the program, and anyone that wants a bin can get one by ordering through Duke Recycles for a small fee. They also have several sizes. Sure, recycling led to other things, and then to other, other things and then to this column, but I will always carry a soft spot for this initial introduction to being a citizen of the Duke community. Of course, once you become aware of an issue, it tends to stay with you as well (or I’ve just gone crazy for recycling). 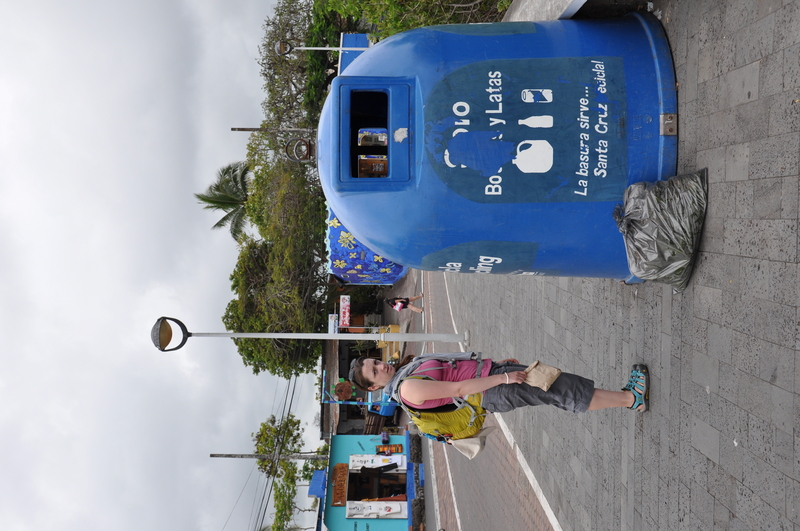 Recycling collection location in Puerta Ayora, Santa Cruz Island, Galapagos, Ecuador. Since participating in this project two or so years ago, I have started to notice recycling stations everywhere I go. This means that at road races I notice the teams sorting water bottles; I have lost my tour group taking pictures of the recycling station in what amounts to the back alley of the White House; and, when I was in the conservation mecca that is the Galapagos Islands over Thanksgiving—you guessed it—I had my picture taken with some super huge recycling bins in the main port town of Puerta Ayora. OK, so I’m gaga for recycling. What’s your story? In the vein of “StoryCorps,” or “This American Life,” I want to hear from you. Think of it as the Green Devil Recording Project. No matter how small or how big, no matter the corner of campus, e-mail me, and we can record your sustainable stories, anecdotes or experiences in an interview that might just appear in this column. I know I’m not the only one out there, because I’ve already met some of you, so e-mail me at dukegreendevil@gmail.com. Funding for the “green devil recording project” was approved today! What is the project? The goal is to collect green stories, antecdotes, experiences and interviews from Dukies across the University, be they students, alumni, faculty or staff. Do you have a story to contribute to the project or know someone who does? Email me at dukegreendevil@gmail.com. The “green devil recording project” has been made possible with funding from the Green Grant Fund. Have an idea to make Duke “greener”? Check out the website, and put in a proposal today! Grants have been awarded to fund various projects including research, conferences and new programming.